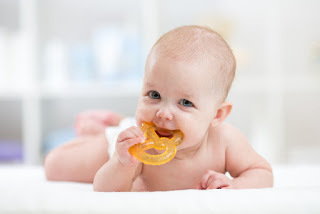 Teething Stages - Adelberg Montalvan Pediatric Dental PC & Orthodontics too! Your child is teething and you’re looking for answers on what to expect. You’ve come to the right place, At Adelberg Montalvan Pediatric Dental, we want to ease the pain that comes along with teething and help give you the right information. Stage 1 (0-6 months): All 20 primary teeth are there beneath your little ones’ gums. – These are sometimes called “milk teeth” due to the diet. Stage 2 (6-8 months): The first four teeth emerge. These will be the upper and lower incisors. – Give your baby something appropriate to chew on to ease the pain. Be aware of extra drool. Stage 3 (10-14 months): The other incisors and first molars erupt. – Your little one will be uncomfortable and cranky. Be prepared for changes in sleep patterns. Consult with a pediatrician if you’re considering over-the-counter pain medications. Stage 4 (16-22 months): This is when the canines (between the incisors and molars) erupt. – Use the comfort ideas from the previous two stages. Stage 5 (25-33 months): This is the big one, literally. This is when the second molars, the biggest teeth, erupt. – This will not be pleasant for your little one, and the things that worked previously may not help anymore. – If on solid foods, let your little one chew on safe, hard vegetables like a peeled cucumber bit. Be watchful for choking hazards and allergies though. – Over-the-counter pain remedies may be appropriate, but always consult with your child’s pediatrician for what is safe and what the proper dosage is. If you feel you’re out of soothing ideas or have more questions about teething, contact us. We’ll be glad to make recommendations and answer all questions! As you and your child grow through this teething process, it is important to remember that there are trained, friendly professionals who are here to guide you.